I love to write paranormal fantasy novels and also review other authors' books, help promote and become lifelong friends. 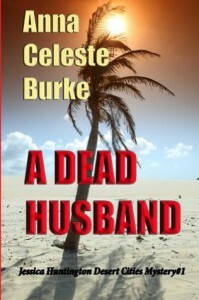 A Dead Husband by Anna Celeste Burke is a flawless diamond of perfection, oozing class, wealth and the underbelly of crime sizzling below the surface. The opening chapter is amazing and the author wastes no time in setting the mood with two rich wives, Jessica and Laura, living their routine existence of expensive designer clothes, gorgeous homes in Palm Springs, luxury cars. The descriptions draw the reader into this elite world only to have them smacked across the head as this world is violently torn apart. And once Jessica's rich world has been trodden on she must put on her detective shoes as a lawyer and discover why her best friend's husband has been brutally murdered in their home. Here the author excels at wringing every emotion to fully explain just how terrible a violent loss can be to family and friends. But the violence doesn't stop there as Jessica delves deeper into the seedy underworld of organized crime and those who flit around its fringes. Not your usual hard-nosed, hard-boiled detective thriller, more your Gucci loafer, Cristal kind of work. This reader had a hard time putting down this superior detective thriller seen from the POV of a woman in no way trained to handle the toughness needed. Every chapter brought fresh information like a detective's report piecing together a maelstrom of unfathomable clues. A masterpiece of detective writing made all he more brilliant by this great author's talent. FIVE STAR detective thriller and very highly recommended.